Melbourne-based Kokoda has purchased its second Brisbane site in six months with a $9.5 million DA-approved riverfront purchase in St Lucia, with plans for a $75 million development with 60 apartments. Design for the 15-level tower was inspired by 'overseas study tours' and is described as a high end, luxurious offering with the aim of appealing to buyers with more 'refined tastes'. A substantial number of penthouses are currently planned, each with floor plates in excess of 200sqm. Sales and Marketing Director Sam Tucker said Brisbane was moving away from investor-driven projects to a smaller, but stronger, owner occupier market that demands only the best in quality from its chosen residences. “The Brisbane market has transformed and offers exceptional opportunity for developers looking to offer premium product as higher-end purchasers are now driving the demand,” said Tucker. “Previously, the high volume of apartments being pushed through the pipeline were small apartments designed purely as investment stock. We’re now seeing a real change in the Brisbane environment as the stronger owner occupier market emerges. These buyers have refined tastes and are seeking a higher level of design and finish as a result. New apartment sales in Brisbane have collapsed by more than 70 per cent in a year according to research by Urbis. The developer’s Chester & Ella Newstead development generated $95 million in sales in its first four weeks. In December 2016, Kokoda entered the Brisbane market with a $12.5 million site in Milton that will offer 235 luxury apartments. “At Kokoda, our strategy is to move at a counter-cyclical direction to the rest of the market. The sales success of our previous project is testament to the strong ongoing demand from the higher end of the market,” said Tucker. The development, located 6km from the CBD, will feature themes of New York’s upper east side while classical elements pay homage to St Lucia’s existing period architecture and reputation as one of the most prestigious suburbs in Brisbane. 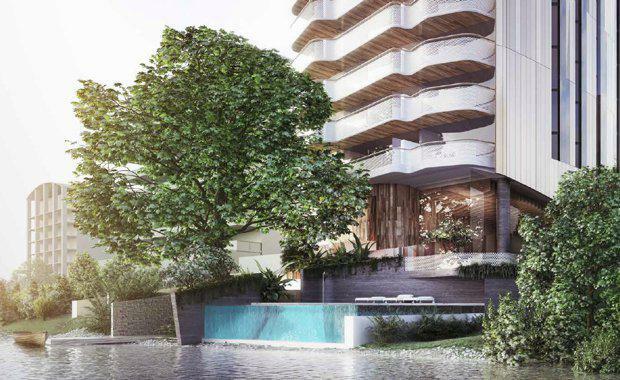 Kokoda Property’s plans for the site include an infinity pool and an outdoor area to be built around a majestic heritage-protected weeping fig tree, plus an outdoor gym.